This page introduces our leadership here at Farm & Home Hardware. Although we are all different, we are united with a common goal. Our "Family" here at Farm and Home Hardware is made up of individuals from all walks of life. Although different, we all share the common goal of helping to further the growth of our community, one customer at a time. 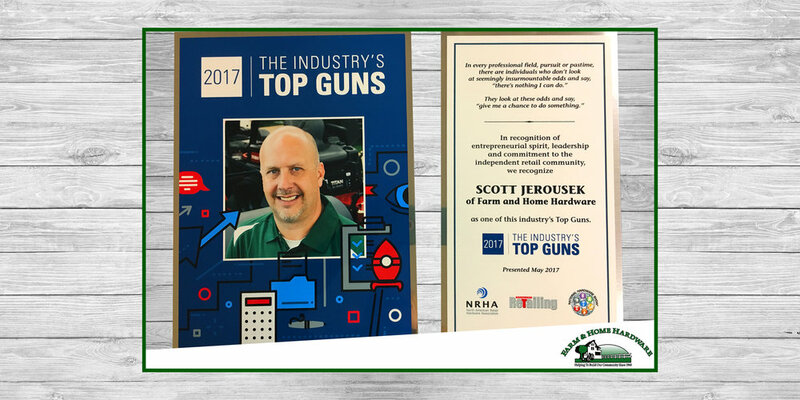 Since first taking over the company, Scott has actively sought to continue its growth, while staying committed to our core values. It's not uncommon to find him loading a hefty bag of concrete into a vehicle, running the register, or giving a helpful hand. He has earned the respect of his employees, customers, and the community as a whole. Tom first came onto the scene a number of years ago. Starting as a Stockman in 2002, he was here for a time before moving onto other opportunities. As fate would have it he has returned full circle, and landed in the management team. Always on the go he's right there to help out, and constantly looking for additional ways to improve. First on the job 6 years ago, Jim is a go-to resource for everyone here. Knowledgeable in mowers, plumbing, electrical, and more, he leads with positive outlook and enthusiasm. A member of Store No. 2, he is a valuable asset to the crew. Jimmy has been a part of the team for many years. Originally starting as a Stockman he has since become a valuable member of our management staff. Furthermore, he is responsible for elevating our Sporting Department to the position it now holds. Recently, Jimmy has taken on many more responsibilities, one being the management of the Stock Crew. He provides daily direction and encouragement, enhancing the crew, and the store as a whole. For about 5 years Heather has been an active member of Farm and Home Hardware. Currently the newest member to the Management Team, she is full of new ideas, and eager to keep the store full of new merchandise. Whether it's working in the Garden Center during the summer season, or updating our Carhartt department during the winter, she is always on the go. DeNita joined the team in 2014. It did not take long for her passion of the arts to influence this department. She has transformed a once underperforming section into a flagship portion of our store. Through DeNita, the company has seen the introduction of events such as Ladies Night Out and more, each providing ideas and inspiration for many. Always wearing a smile, she provides daily encouragement to everyone she meets. Erin quickly became an essential element of the company. Wearing many hats she coordinates events, social media, newsletters, and much more. Though usually in the office, she provides a positive and upbeat mood everywhere she goes.